A little change of pace for me today. 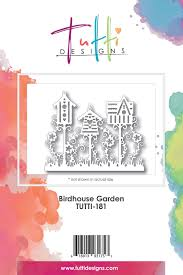 This card showcases an oldie but a goodie Tutti Designs die, Birdhouse Garden, which was released back in the October Release of 2016. I love this die, because it reminds me of putting my own gardens to bed for the upcoming season. I adore Fall and all it brings, even if my pretty blooms go dormant for a while! Once again I cut this beautiful Birdhouse Garden die from White card stock. I colored it using Copic Markers. I also added some Pink and White card stock to the back of the birdhouses and the pretty yellow flowers. This technique gives a bit more oomph to your die cut. Then I added Versa Mark ink to the entire die cut, coating in clear Embossing Powder and heating. This always adds such a nice shine to what you are creating AND it makes your die cut look like a pretty embellishment. If you do this with many layers it becomes an absolute gorgeous chipboard like piece......which as you all know, adds depth and dimension. As I only cut one layer, this is still a nice flat card for easy (no extra postage) mailing. What a fabulous card and yes, it's that time of year again! Where is the time going! Love the pretty colors on your bird houses! Well done! Lovely! All the brightly colored houses against the black background really pop. The look like they glow in the dark!